Click here to find a valve cover gasket for your vehicle. Although modern engines are vastly more resistant to fluid leaks than the engines of 20 years ago were, valve cover gasket failures are arguably the most common cause of engine oil leaks worldwide. Here is what to expect if you have to replace the valve cover gasket(s) on your vehicle. As the term suggests, valve cover gaskets serve as seals to both prevent engine oil from leaking from between the valve cover and the cylinder head as well as to prevent dirt, water, and other contaminants from entering the engine through the gap between the valve cover and cylinder head. Apart from cylinder head gaskets, valve cover gaskets are among the most highly engineered seals on any modern engine. In practice, valve cover gaskets have to resist chemicals (such as the acids that form in motor oil), retain their shape and resilience during extreme temperature swings, and maintain their sealing properties under constant vibration. All of the above requirements place extreme demands on any valve cover gasket, but to complicate matters further, valve cover gaskets typically have very complex shapes and minimal thickness which means proper alignment is key to achieving proper a proper seal. Although most valve cover gaskets typically are not subject to high pressures or vacuums, the clamping forces that establish a positive seal between the gasket and sealing surfaces are also typically very small, which means that the quality of a valve cover gasket installation is a critically important factor in the efficiency of any valve cover gasket. Finally, we should make note that for cars that have engines with multiple cylinder heads, such as V6 or V8 engines, there is typically one valve cover per cylinder head. As such, these engines require multiple valve cover gaskets (one for each valve cover). While visible oil leaks are by far the most common symptom of leaking valve cover gaskets, they are rarely large enough to see oil pooling on the floor beneath the car. Often times, the oil will be dried and caked in the vicinity of the valve cover gasket. If you see this, it’s time to replace the gasket. If left unattended, more significant consequences can occur as the oil can contact other components in the car, causing potential damage to those components. If a severe valve cover gasket leak is not resolved in a timely manner on a vehicle with a manual transmission, oil may collect on parts of the engine that mate with the transmission. If enough oil is present, it is possible for it to collect on the clutch assembly which can cause the clutch to slip. The remedy for this issue is typically replacement of the clutch. In some cases, oil that leaks past defective valve cover gaskets can cause engine oil to be deposited onto the timing belt. Since timing belts are typically not designed to resist chemical attack by engine oil, this can result in premature timing belt failure, which can cause extremely serious damage to certain types of engines (specifically interference engines). Many modern engines require vacuum in order for several engine management systems to work efficiently. This means that if a valve cover gasket leaks, these engines are deprived of the required vacuum, which can cause issues including rough or erratic idling, rough running at some engine speeds, random misfires, and even surging or hesitation under load. In cases where engine oil leaks onto hot exhaust components, such as exhaust manifolds and/or catalytic converters, the partially burnt oil may contaminate the air under the vehicle that oxygen sensors use for reference purposes to aid in fuel metering. If this happens, oxygen or air/fuel ratio sensors may report a rich-running condition, which the ECU will attempt to correct by leaning out the air/fuel mixture. This could in turn cause varying degrees of power loss, and in severe cases, the illumination of the check engine light, for which you will need an OBD code reader to diagnose the cause of. The process of replacing valve cover gaskets typically ranges from easy to moderately difficult, but as a general rule, most DIY mechanics should be able to replace valve cover gaskets on their vehicles without experiencing undue difficulties. Step 1 – Make sure that the engine is cold to prevent burns and scalds. Use suitable tools, such as screwdrivers or a set of Allen wrenches to remove any cosmetic covers over the engine that may be in your way. Place all covers as well as their fasteners safely aside. Note though if the engine is caked with mud or dirt, be sure to have the engine cleaned prior to starting work to prevent dirt and other contaminants entering the engine when you remove the valve cover. Step 2 – Disconnect all electrical connectors to ignition coils, injectors, and other components that may impede your ability to remove the valve cover. If you have to disconnect vacuum lines and or hoses, make a careful note of their exact routing to prevent reconnecting the wrong line to the wrong attachment point later. Disconnect the battery prior to working with any electrical components to avoid risk of shock. Step 3 – Once you are certain that you will be able to lift the valve cover clear of the engine, use suitable tools, such as a ratchet, socket extension, and a deep socket to undo all fasteners that fasten the valve cover to the engine. Note that in some cases, the retaining bolts are incorporated into the valve cover, and can therefore not be separated from the valve cover. Step 4 – Place all removable fasteners aside, lift the valve cover clear of the engine, and remove the old gasket from the valve cover. This can be done using a gasket scraper but take care not to damage the valve cover sealing surface or you may allow a pathway for future leaks. Take care not to allow dirt or contaminants to get into the engine. This may be accomplished by covering the open engine with a lint-free object such as a clean plastic sheet or even a clean garbage bag to prevent the ingress of dust and dirt into the engine. Step 5 – Remove all traces of engine oil and contaminants from the mating surface on both the cylinder head and valve cover. Ensure that the valve cover is completely dry prior to replacement. If you have an air compressor and a good air hose, you can use compressed air to help blow out any moisture that may be trapped in splash plates and baffles. Failing to do this could prevent the gasket from creating a positive seal when you torque down the valve cover bolts. Step 6 – When the valve cover is clean and free of moisture, fit the replacement gasket but make sure that all tabs and locating lugs are properly seated to prevent the gasket from moving out of position when you place it on the engine. Note that most applications call for valve cover gaskets to be installed dry without any type of sealant, although we recommend following manufacturer instructions regarding the use of sealant. Step 7 – Insert all fasteners, but be sure to start them by hand in order to prevent potential cross threading. Tighten fasteners hand tight, and only do so in a crosswise pattern to ensure even tightening. Then, use a calibrated torque wrench with appropriate torque range to torque all fasteners to their recommended torque values in a crosswise pattern. Take note that valve cover fasteners usually have very low torque specifications. Step 8 – Once the valve cover gasket is installed, reconnect all previously removed components in the reverse order to which they were removed. Start the engine to check for leaks (and repair as necessary) before refitting engine covers. Felpro uses patented rubber and other compounds to ensure that the valve cover gaskets they produce either meet or exceed OEM specifications in terms of fit, form, and function. Moreover, Felpro operates a field-testing facility that tests new products under real-world operating conditions on roadgoing vehicles for up to a million miles per year. Overall, Felpro makes great gaskets for pretty much every mating surface in a modern engine, and their valve cover gaskets are no exception. Overall, we think you’ll be highly satisfied if you opt for a Felpro valve cover gasket for your next replacement. 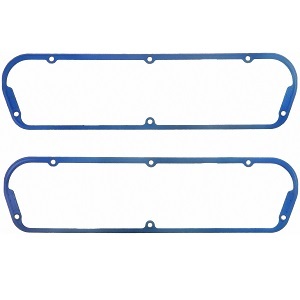 Click here to find a Felpro valve cover gasket for your vehicle. Victor Reinz valve cover gaskets are fabricated from a patented and proprietary silicone rubber compound that is designed to resist shrinkage, hardening, and chemical attack by fuel and oil. Victor Reinz valve cover gaskets are typically designed for use without sealants, since most of their valve cover gaskets are provided with either pre-molded bead type seals or profiled ridges to improve the sealing properties of gaskets with complicated profiles or convoluted shapes. Overall, Victor Reinz makes excellent valve cover gaskets and you can’t go wrong if you decide to install one on your vehicle. Click here to find a Victor Reinz valve cover gasket for your vehicle.